It’s morning at Mercedes House, the apartment complex on West 54th Street in Manhattan, and the little ones are frolicking in the loft area, near a big caterpillar-shaped play structure. Later, they might be taken out for a walk. And when they’re all tuckered out, they can curl up on cots. But this brightly lit space, part of an 1,800-square-foot facility that opened last summer, is not for human youngsters, it’s for dogs — one of many pet amenities that have sprung up in residential buildings in New York in recent years in a bid to entice renters and buyers devoted to the four-legged members of their families. “Hello, Bagel!” said Zachary Morello, the manager of this outpost of the Spot Experience, a dog-care company, as a goldendoodle approached. When “pet spas” were introduced in high-end residential buildings a decade or so ago, they might have seemed like another flash-in-the-pan perk. But they’ve not only hung on like a dog with a bone, they’ve also evolved. Slop sinks for pet washdowns have been replaced by gleaming professional-grade tubs. Closet-size spaces have expanded into sprawling facilities where pooches enjoy “cage-free” day care and work off paunches on treadmills, not to mention getting dolled up in the latest hairdos. (Pomeranian lion cut, anyone?) And while these facilities are still most often associated with upscale developments — and, yes, widely mocked as an expression of the misplaced priorities of the privileged — they are beginning to show up in affordable housing, too. “First they didn’t exist; then they existed; now they’re more thoughtfully designed,” said Rachel MacCleery, a senior vice president of the Urban Land Institute, a research organization, which has tracked the pet amenities trend. Pet amenities first began cropping up around the United States in the early 2000s, she said, and proliferated as the real estate industry recovered after the recession. Nationwide, dog ownership is climbing, fueled in part by millennials who are postponing marriage and child-rearing — and getting a pet instead. The American Pet Products Association found in its most recent pet-owner study that 44 percent of American households, or more than 54 million, own at least one dog, up from 38 percent, or 35 million, in 1990. Elaine Tross, an associate broker at Halstead Property who runs a website called Pet-Friendly Manhattan Real Estate, estimated that about 50 percent of residential buildings in New York today allow dogs, with condominiums and co-ops generally more pet-friendly than rentals. Buildings often apply restrictions on breed and weight and charge pet fees, which Ms. MacCleery, of the Urban Land Institute, calls a new revenue source for buildings. Some real estate companies are not only allowing pets, they’re catering to them. The Related Companies, after experimenting with small, unstaffed grooming stations in a couple of its buildings in New York about a decade ago, has been rolling out its own proprietary program, called Dog City, in its properties, offering day care, training and weekly visits from groomers and veterinarians. “It’s a way of showing residents we understand their lifestyle,” said Daria P. Salusbury, the senior vice president in charge of the company’s luxury residential leasing operations. Dog City’s first branch, a 1,000-square-foot facility that opened five years ago in MiMA, a rental/condo complex on West 42nd Street, proved so popular that its outdoor terrace, where in warm weather Dog City members gather while their dogs splash in a bone-shaped pool, was quickly expanded. This month, the facility is embarking on a remodeling that will involve enlarging the terrace again. Of MiMA’s 200 or so dogs, 80 are members of Dog City, according to Young Jee, the president of Dog City. Members pay a $250 annual membership fee plus monthly add-ons ranging from $40 (for self-service use of the facilities in the off-hours) to $750 (daily day care with walks and report cards written by handlers, plus an ear wash and “pawdicure”). At Related’s Abington House rental, in Chelsea, where dachshund-shaped benches adorn the lobby, Dog City is decorated with poster-size portraits of resident canines. 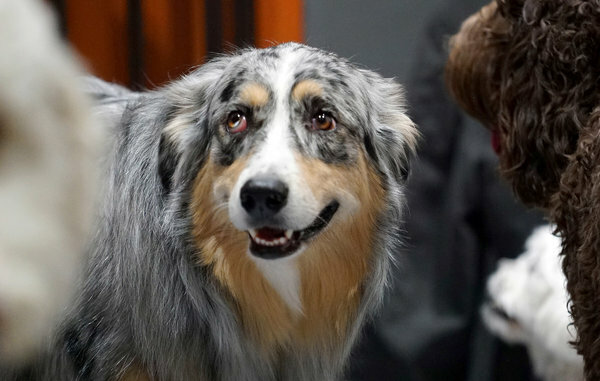 Dogs can get checkups in a private room with an examining table and a professional veterinary scale that can accommodate a full-grown St. Bernard. Dog City’s flagship location — a 2,500-square-foot facility in the nearby Caledonia condo/rental complex, which will offer boarding for up to 20 dogs a night — is scheduled to be completed this spring. The Dog City branch at Hunter’s Point South, an affordable housing complex in Long Island City, Queens, just opened for business, with no annual membership fee and monthly charges maxing out at $300. “The fee structure is scaled to the population of the building,” Mr. Jee said. Other real estate companies have chosen not to develop in-house expertise but rather to outsource the job. Under an arrangement between the Gotham Organization and the Spot Experience, pet owners in Gotham’s buildings get a discount on Spot services, with their dogs picked up by van and transported to the dog company’s retail outfits, such as the 9,000-square-foot one on West 42nd Street, at the base of Silver Towers. That is where Oscar the Frenchie, a French bulldog with legions of followers on social media, celebrated a recent birthday, a slumber-party-themed affair with guests arriving in pajamas. 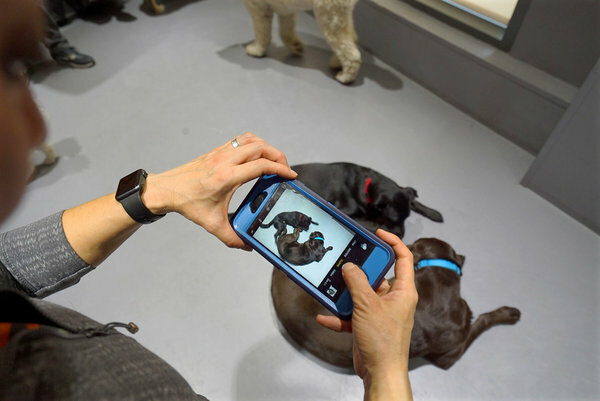 It was quieter on a recent tour, with big dogs milling around the big-dog room and small dogs frisking in their own more modestly scaled quarters — all of the action captured on webcam for the benefit of owners who were traveling or toiling away at work. Meanwhile, in the grooming station on the floor below, a cockapoo got a haircut and a Pomeranian sat under the hair dryer. Even when building owners opt to create more modest self-service grooming facilities, the equipment has been upgraded. At 51 Jay Street, a former factory in Dumbo, Brooklyn, being converted to residential condos slated for occupancy in the fall, dogs returning from a romp in Brooklyn Bridge Park will be able to get cleaned up in a handsome stainless-steel tub — in keeping with the industrial aesthetic of the building — before padding onto the herringbone-patterned oak floors in the residences upstairs. Here and at many other new developments, the pet wash is on the floor below the lobby, a level where developers have been putting pools, gyms, children’s playrooms and bike storage. Just don’t call it a basement. “It’s the amenities floor,” said Deborah Brener Zolan, the building’s sales manager and an agent at Halstead Property Development Marketing. Indeed, uptown at 252 East 57th Street, the Skidmore, Owings & Merrill-designed condominium under construction near Second Avenue, the 950-square-foot pet space on the floor below the lobby promises to be positively airy, with nine-foot ceilings, a sophisticated ventilation system, grooming equipment and plenty of room for pups to meet for playdates, according to Pamela D’Arc, the sales director, who is an associate broker at Stribling & Associates. Sometimes the pet amenity materializes in more unexpected places. At the Brooklyn Trust Company Building, in a 1916 former limestone bank in Brooklyn Heights, the grooming station will be in the old vault off the lobby, across from bike and stroller storage. Nearby in Downtown Brooklyn, at a rental/condo building at 388 Bridge Street, the 91-square-foot space is utilitarian: white tile walls, molded-plastic tub, hand-held shower. Is “pet spa,” as it says on a plaque on the door, perhaps an overstatement? Terminology aside, these spaces are surely a boon to dog owners who want to keep their own tubs tidy.